James Taylor, performing as part of Guitar Center Sessions’ season 11. Season 11 to debut Nov. 13 at 9 PM ET/PT on AUDIENCE® Network (DIRECTV ch. 239 or AT&T U-verse TV ch. 1114). Los Angeles, CA (November 2, 2015): Guitar Center and AT&T have announced Season 11 of the retailer’s award-winning music television series Guitar Center Sessions presented by JBL. The series will return on November 13 with 10 new episodes available Friday nights at 9 p.m. ET exclusively on AUDIENCE® Network (DIRECTV ch. 239 or AT&T U-verse TV ch. 1114). A testament to the quality content and dedicated fan base, Guitar Center Sessions Season 11 sees the series hit 100 episodes. To mark this milestone, the season features a staggering lineup of artists including legendary acts like James Taylor and Chicago, country powerhouses Merle Haggard and Jerrod Niemann, international pop stars Jason Derulo and Sean Kingston, talented singer-songwriters The White Buffalo and Matisyahu, and buzzworthy indie acts Metric and St. Lucia. Guitar Center Sessions provides award-winning music television content to DIRECTV and AT&T U-verse customers, presenting exclusive live performances in stunning HD** and 5.1 surround sound. In addition to show-stopping performances, each episode features intimate interviews conducted by renowned journalist Nic Harcourt, offering rare insights into the celebrated careers of these icons and the inspirations behind their music. Born out of Guitar Center’s desire to deliver high quality music programming to music fans nationwide, the series has since gone on to featured artists as diverse and iconic as Peter Gabriel, Soundgarden, Snoop Dogg, LINKIN PARK, OneRepublic, Phantogram, Joan Jett, The Smashing Pumpkins, Jimmy Cliff, Damon Albarn, Social Distortion and more. ** To access HD programming, HD television and equipment required. 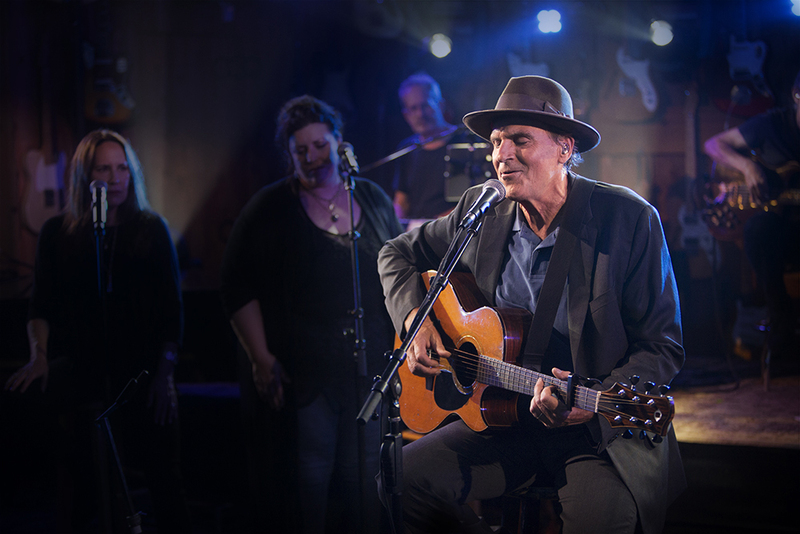 Photo caption: James Taylor, performing as part of Guitar Center Sessions’ season 11. Signal and reliability strength claims based on nationwide carriers’ 4G LTE. Signal strength claim based ONLY on avg. 4G LTE signal strength. 4G LTE not available everywhere. Guitar Center is the world’s largest retailer of guitars, amplifiers, drums, keyboards, recording, live sound, DJ, and lighting equipment. With more than 260 stores across the U.S. and one of the top direct sales websites in the industry, Guitar Center has helped people make music for more than 50 years. In addition, Guitar Center’s sister brands includes Music & Arts, which operates more than 140 stores specializing in band & orchestral instruments for sale and rental, serving teachers, band directors, college professors and students, and Musician’s Friend, a leading direct marketer of musical instruments in the United States. With an unrivaled in-store experience, an industry-leading online presence and passionate commitment to making gear easy-to-buy, Guitar Center is all about enabling musicians and non-musicians alike to experience the almost indescribable joy that comes from playing an instrument. For more information about Guitar Center, please visit www.guitarcenter.com.